Donegal captain Michael Murphy admitted after the game on Sunday that Kerry were simply the better team on the day and they fully deserved their victory. 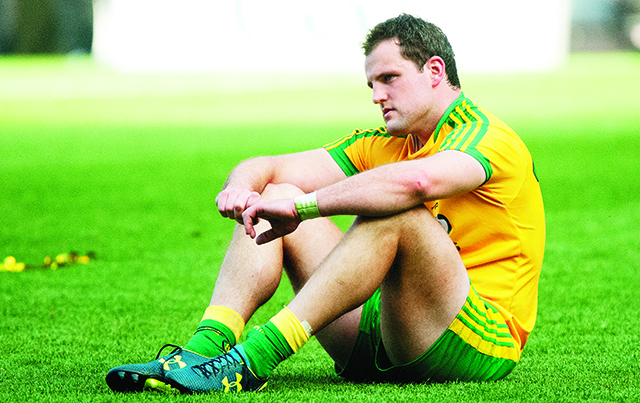 Murphy looked heartbroken as he spoke to the Inishowen Independent after the game in Croke Park. “Kerry performed slightly better than us today and I have to say they deserved their victory and fair play to them,” said Murphy. The early goal from Paul Gainey inside the first minute was a real sucker punch to Donegal and the captain believes that the fact that Donegal were always chasing the game after this made it very difficult. “The big problem was that we were always responding and never really got on the front foot all day and this made it very difficult for us but look we just didn’t perform today and that’s the end of it really,” he said. Murphy cut a dejected figure in the middle of Croke Park after the game and he admits that it was very difficult to watch as Kerry went up the steps of the Hogan Stand to lift Sam. “Ah look, we wanted to be up there lifting it obviously and its hard to take. We just need to take time now to reflect and look back on it and we’ll take it from there,” said the big Glenswilly man. Murphy was then asked about the upcoming club championship which will see his club Glenswilly looking to retain their title, but he was in no mood to speak about anything else. “Look this defeat is still very very raw and there isnt much I can say to you about the club championship at the minute,” said the dejected captain. The final question put to the captain was what it was that went wrong in the game and he admitted that he simply didn’t know what happened. “I don’t know what went wrong to be honest with you. All I do know is that its very very hard to take,” said Murphy.